Since the settings are set up correctly, we can now run the APT Process. If Revoice Pro is the selected program, simply LEFT CLICK the New Process button at the bottom of the New Process window or press the N key (shortcut) on the keyboard. The result of doing this is shown right. 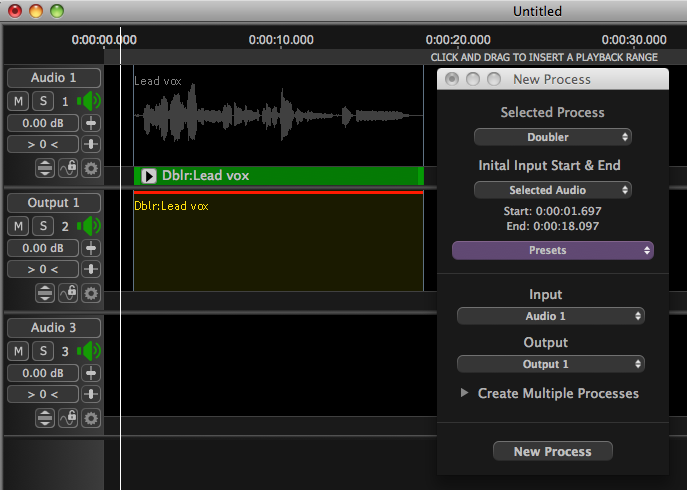 In this example, two things are visible: Firstly, a green (selected) Process Control Block labelled "Dblr:Lead vox" has been inserted in the Process Control Track below Audio 1. Note this is the length of the previously selected audio (and the audio is no longer shown selected). This shows where the processing will start and end. Secondly, in the Output 1 track, the Double output signal has been reserved with the label: "Dblr:Lead vox" and a red line shows that the process is ready to be "run" to render the output audio. If background processing is turned on the output audio will be rendered immediately. To inspect and change settings in the Doubler Process Control Panel, make sure the Doubler Input Control Block is selected (green), and the Session window is active, press the P key on the keyboard (or the "open" arrow in the Guide or Dub Process Control Blocks) to open the Control Panel as shown right. Make any required adjustments and then press P again (or the close button) to close the panel.